AMMAN, JORDAN - Tarek al-Masri, a Jordanian lawyer who studied in Egypt, has been closely following the upheaval there with mixed emotions: happy that the Egyptians have finally risen up against an oppressive ruler but worried about a power vacuum in the streets. When he considers a growing challenge to the government in his own country, where the authority of the monarchy is an article of faith, there's one line he won't cross. "I'm upset by the social problems, the economic problems, the political problems, and the parliament doesn't represent the people," Masri said. But, he added, "I cannot imagine the country without the royal family. They strike a balance between the people and the government. I trust them." The lawyer's ambivalence is shared by many in this kingdom, where King Abdullah II, a key U.S. ally, has come under pressure in recent weeks from protests by a coalition of Islamists, secular opposition groups and a group of retired army generals who have called for sweeping political and economic reforms. The demonstrations, inspired by the unrest in the region and joined last Friday by thousands across Jordan, reflect growing discontent stoked by the most serious domestic economic crisis in years and accusations of rampant government corruption. 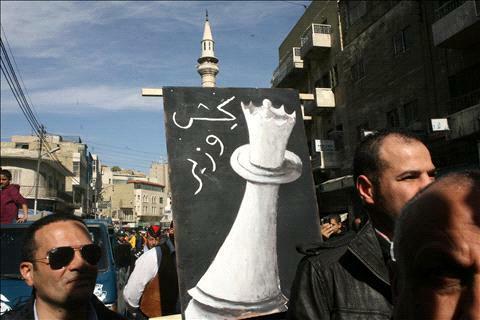 Demonstrators have protested rising prices and demanded the dismissal of Prime Minister Samir Rifai and his government, but they have not directly challenged the king, criticism of whom is banned in Jordan. The demonstrations have been peaceful and have not been confronted by the police. In an attempt to defuse tensions, Rifai has announced a package of new subsidies for fuel and basic goods, as well as pay hikes for civil servants, an increase in pensions and a job creation initiative. The king has met with members of parliament and the appointed senate, urging reforms, and officials say he has talked to representatives of various groups, including unionist and Islamists, to hear their grievances, and even visited poor areas to get a firsthand look at people's needs. In his meeting with the parliament members last week, Abdullah said more should be done to address the concerns of ordinary Jordanians, and that "openness, frankness and dialogue on all issues is the way to strengthen trust between citizens and their national institutions," according to a palace statement. But leaders of the protests say the king has failed so far to take substantial steps to address mounting public resentment, and they warn that unless genuine changes are made, the unrest could worsen. Zaki Bani Irsheid, head of the political department of the Islamic Action Front, an arm of the Muslim Brotherhood, Jordan's largest opposition group, said that its main demands were dismissal of the government by the king, the dissolution of parliament - elected in November in a vote widely criticized as fraudulent - and new elections. The opposition is also demanding the election of the prime minister, currently appointed by the king, and amendment of the election law, which critics say is designed to underrepresent opposition elements in the legislature. Abdullah's response so far has been "just a public relations campaign that doesn't solve the crisis," Bani Irsheid said in an interview. "The regime wants a solution without paying the price, and it is offering cosmetic changes. We told them that what was acceptable yesterday is not acceptable today, and what could resolve the problem today may not be a solution tomorrow. Delaying and hesitation will only complicate matters." For now, the lighting-rod for the criticism are the prime minister and members of his cabinet, whom opposition critics accuse of personally profiting from the sale of state companies as part of the king's policy of privatization and free-market reforms to attract foreign capital. "It's a club of businessman serving their financial interests," said Nahedh Hattar, a veteran opposition activist. "The king is a member of the club." Critics like Hattar say that the king's policies, and accompanying corruption, have only widened the gap between rich and poor and exacerbated Jordan's economic ills, which include a rising national debt, and high levels of unemployment and poverty. Ali Habashnah, one of the retired generals advocating reforms, said that public resentment has spread to rural areas dominated by Bedouin tribes that have been the traditional backbone of the monarchy and its security forces. It was the first time, he said, members of that segment of Jordanian society had joined with other groups in demands for change. But the generals, who published a manifesto with other retired officers last year outlining their positions, have asserted their loyalty to King Abdullah and say they are seeking reforms under the monarchy. The ruling Hashemite family, Habashnah said, is the only force able to unite a nation made up of disparate tribes and other groups. "The Hashemites are the symbol of the unity of the state," he said, but added a word of caution. "If things go on like this," he said, "There's no telling what can happen."